Europe is supposedly facing a migrant crisis. But much better this than the Total War brought upon us by belligerent chauvinistic nationalism and the global arms industry. Since the EU lowered our internal borders, we've saved many millions of hours from national border administrative procedures and associated corruption. We've cut defense spending by hundreds of billions of dollars, while the engines of the USA are still (poorly) propelled by defense expenditures, military employment, etc. American overseas warfare in Afghanistan, Iraq and Syria generated much of this refugee crisis. 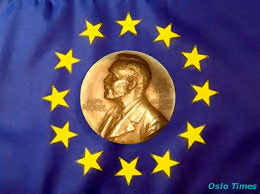 Europe has accomplished much, richly deserving the 2012 Nobel Peace Prize.